We had a wonderful Memorial Day Weekend. Lots of family togetherness, a date night, a family birthday party, and picnicing with friends. Bean went to a baseball game about 90 minutes away on Monday. Which meant he was gone for about 8 hours later in the day and evening. I was glad he accepted the invitation. Bean doesn't do enough for himself. I think as a parent, especially of young children, it's important to have ocassional "me" time. Bean always supports when I want to grab coffee with a friend or go on a solo run. I always encourage Bean to do something for himself. 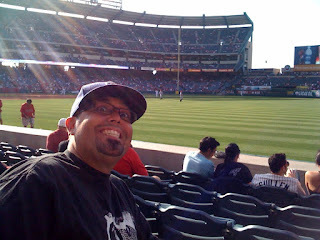 Bean sent me this photo to show how close their seats were to the field and how great his view was. I of course, felt the need to respond with photos of my view at home. Can you tell what that is? Poop on the floor. And no, we do not have a dog, or any other animals. 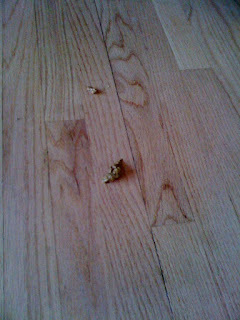 For the record, this was just one of two pooplets and the rest of the poop DID make it in the potty! 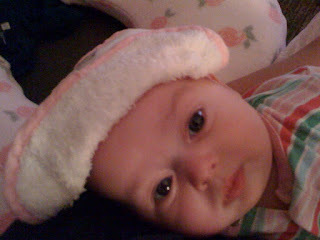 And then there was the feverish baby I spent much of the evening holding and cooling off with a cloth. Some nights the course of events might have driven me to the brink, but in this case I was rather calm, cool and collected. Quality family time will do that to me. I was Queen of the World! I just found the irony rather amusing. Don't you?